Umberto Eco defines the poetic effect "as the capacity that a text displays for continuing to generate different readings, without ever being completely consumed.” I find it justifiable to replace "text" with "perfume"; after all, the latter undoubtedly generates different "readings" under different circumstances, on different wearers and simply during the course of its development. In that respect it too can never be fully grasped or totally consumed, forever escaping full understanding. Having said that, not every perfume has that evasive quality or provides that poetic effect. Simplistically put, only the better ones do. Absolue Pour le Soir does. With every stage of its development and from day to day wearings, it turns to me with a different facet. Sometimes, it is gourmand... cumin coated in chocolate, sprinkled on honeyed petals of a black rose. Sometimes, the cumin has nothing to do with food and is all about flesh, lending the composition a sensual, lustful quality. And sometimes, Absolue is all about incense, leathery, husky, thickly enveloping smoke, Bois d'Armenie on steroids, a perfect comfort scent for a winter soir. The play of ingredients aside, this creature can't even be categorized in terms of its species. As soon as I start thinking that it is human, all too human, a distinctly animalic feel takes over, and the perfume acquires a supple and rugged texture of bullhide. Rich as it is, the blend is fairly streamlined, and thus I find it to be distinctly modern. And yet there is something not even old-fashioned, but ancient about it. Smelling Absolue Pour le Soir, "I look through the eyes of the beast to find the man." Or vice versa... Highly recommended. Available at Luckyscent and Franciskurkdjian.com, $175 or 115€ for 2.4oz respectively. 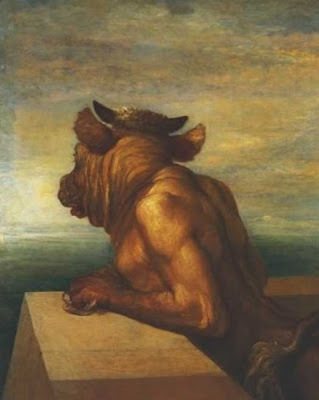 Image, The Minotaur by George Frederick Watts. I love the Minotaur as the embodiment of Absolue Pour le Soir, Marina! Perfect. I'm recommending it to myself aas well. :) I'm just waiting for Flores here to get their batch so I can grab a bottle (I won't think about the price). It is a welcome addition to this line, which so far has strayed little out of BCBG demeanor. I love this one so much I can't believe that it's supposed to be the darker version of Pour le Matin.. It's available at Neiman Marcus as well, BTW. I wore this on Wednesday night for a first/blind date. It was a cool rainy night and APLS was just radiating. Date was terribly shy and reserved at first but by the end of the night was not able to remove his nose from my neck. So, yeah, it works. Almost too well. What a perfect choice of picture for this perfume! I love the perfume as well and I definitely get a lot of the elements you mention. My favorite part is when it settles into warm honeyed skin, maybe with a little sweaty edge. Gorgeous. one of my absolue ( :) ) favorites! i am even wearing it today - layered with cologne pour le soir. i picked it because i knew it would be a stressful work day, and wanted something to make me feel like moi, and in charge. you're right about its many facets... each one so smooth, too! glad you're digging it! It's the same with art, movies, etc. I like when they escape me a bit. Sometimes the price almost doesn't matter, right? I don't think many of mine were love from first sniff either. So true! Others are perfectly nice but kind of boring. I would be most curious to hear what you think! Glad to share a favorite with you! It is such a strong scent you must be confident to pull it off. I am on the fence about whether I like it or not. I will give it another try before I decide. I have a little sample of this and I totally love it! It's everything you said and more, and I will have a bottle someday. I don't know exactly where I can wear it, but even if I never leave the house it in it's so beautiful I don't care! Love at first sniff here. Great image choice too! Years ago I would never have appreciated a perfume like this, so I am glad my fragrance education has led me in this direction. I have played with this a few times, and it has presented itself differently almost every time. (Or is it my reading that is the factor here??) What I know is this: I had one afternoon so fabulous that I want to go back again, and am willing to do so many times, just to find what that was. Yes, in a practical sense, I usually have to go through a whole lotta cumin to get there. Like you, for me the cumin in this one is all animal. I'm kind of chuckling how Katie firmly shellacked the minotaur on top of your presentation for me; chuckling, because I can work with that. Through the maze, indeed. I was so disappointed with the other perfumes in this line that I was resistant to try Absolue. But oh is it good. It's become one of my go-to's. This is the first time I've really read anyone talking about its mercurial nature. I think you're right. It's been my experience, too, at least. Sometimes it seems so sweaty and feral. Other times, edible. It's always warm and instantly calming for me, whatever it's manner of the moment. And it lasts pretty impressively.